8/10I received a review copy of The Tethered Mage in exchange for an honest review. I would like to thank Melissa Caruso, Nazia, and Orbit. I received a review copy of The Tethered Mage in exchange for an honest review. I would like to thank Melissa Caruso, Nazia, and Orbit. Less than a week ago I had no idea what to read next. I picked up this book as the cover looked gorgeous and contained quotations from RJ Barker, Anna Smith Spark, and Vic James. I’m super happy that I did and I would describe this book as YA political fantasy with magic – almost like the perfect mix of Gilded Cage and The Lies of Locke Lamora. I received an advanced copy of A Time of Dread in exchange for an honest review. I would like to thank John Gwynne and Pan MacMillan for this opportunity. I received a review copy of The Shadow Crucible in exchange for an honest review. I would like to thank T.M. Lakomy and Select Books Inc. for this opportunity. Winter’s Reach is Craig Schaefer’s entry for this year’s Self Published Fantasy Blog Off and is Fantasy Book Review’s first semi-finalist. Although he is mostly known for the Daniel Faust series, this is Schaefer’s foray into writing complex dark fantasy. Will be posted on Fantasy Book Review shortly. Shadow Crucible is such a strong debut novel! I’m not even sure what I could compare this to. It’s almost like a historical fiction with fantastical and paranormal elements thrown in. There still tends to be the stigma surrounding independently published books. This book blows that stigma out of the water. I tend to keep my reviews spoiler free, so I’ll try and keep this as vague as possible. 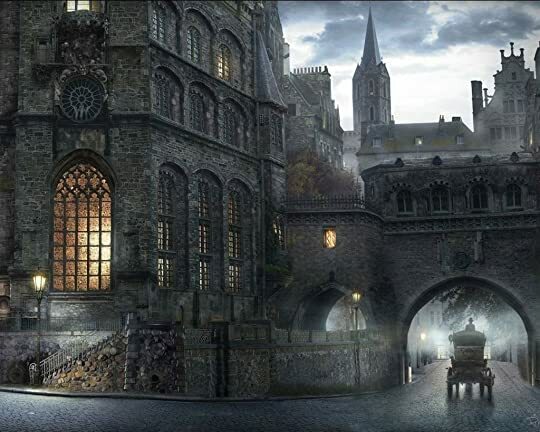 We follow a few characters in the book, 2 more so than the others, and it’s set in the medieval gothic era of London. The 2 main characters of the book are Count Mikhail, a Knights Templar, and Estella, a seer. As you can probably tell, these 2 characters couldn’t be much different. While I really enjoyed them, I think I might have enjoyed some of the side characters more. Mainly Antariel, but stating the reasons would be major spoilers. We also get a really great cast of angels and demons, which is what grabbed my attention with this book in the first place. And Lakomy sure gave us some major players! We’ve got Lucifer, Samael, I think Jesus makes an appearance, and some of the Archangels. My favorite scenes were, by far, when any of these angels or demons made an appearance. You just knew something was going to go down! I did have a few problems with the book, though. It obviously wasn’t anything that ruined the novel for me, or my enjoyment, but I do feel that they’re things worth addressing. Some of the action scenes tended to happen really quickly without much of a segue from it being a calm setting into the action. It wasn’t something that happened often, but I did have to go back and reread a few scenes. The other thing was actually part of what I liked. I didn’t really connect as well with the main characters as much as I did with the side characters. So I look at that one as a strength and a weakness. But I also tend to gravitate more towards side characters in every story I read, so take that for what it’s worth. All in all, I was extremely happy that I picked this book up! It had so many elements that I really enjoyed. If her debut novel is this strong then I can’t wait to see her future works as she grows as a writer! Definitely recommend for anyone who loves a real life setting with some paranormal and fantasy twists to it. I received an advanced copy of The Court of Broken Knives via NetGalley in exchange for an honest review. I would like to thank Anna Smith Spark and Harper Voyager. This will be posted on Fantasy Book Review shortly.